Space Shuttle Endeavour sits docked to the Destiny laboratory of the International Space Station during the STS-118 mission's third planned session of extravehicular activity (EVA). NASA's space shuttle Endeavour flew its final mission in 2011, and the space plane is now heading into retirement as a museum showpiece at the California Science Center in Los Angeles. Over the course of its 19-year spaceflight career, Endeavour logged nearly 123 million miles (198 million kilometers) and zipped around the Earth more than 4,600 times. Here are some other interesting facts about the orbiter. Endeavour is the youngest member of NASA's now-retired space shuttle fleet. The orbiter was built as a replacement for the shuttle Challenger, which was lost in the January 1986 accident that also killed its seven-astronaut crew. Congress authorized the construction of Endeavour — NASA's fifth spacegoing shuttle — in 1987, and the orbiter first blasted off in 1992. Endeavour flew a total of 25 space missions, with the final one launching in May 2011. Endeavour is the only shuttle to have been named by children. In 1988, NASA staged a national competition among elementary and secondary school students to hang a name on the new shuttle. The kids were given some guidance; the name had to be based on a historic oceangoing research or exploration vessel. Then-president George H.W. Bush announced the winning name in May 1989. The shuttle's namesake, H.M.S. Endeavour, was commanded by Britain's James Cook on his epic 18th-century voyage of discovery in the South Pacific (hence the orbiter's British spelling). While Endeavour debuted a fair amount of new gear — it was the first shuttle to use a drag parachute during landing, for example, and it featured advanced avionics systems — much of the orbiter was built from spare parts. These pieces were left over from the construction of the shuttles Discovery and Atlantis. This recycling ethic helped keep Endeavour's construction costs down to $1.7 billion, according to NASA officials. Shortly after NASA's Hubble Space Telescope launched in April 1990, scientists noticed that the instrument's images were a bit blurry. In 1993, Endeavour launched on its STS-61 flight — the first Hubble servicing mission — to fix the problem. In a series of complex operations involving multiple spacewalks, Endeavour's astronaut crew swapped out some of Hubble's optics and other gear. Soon the telescope was seeing the universe in crisp, sharp detail. "Without that mission, Hubble would be rather useless in orbit," said space-history expert Robert Pearlman, editor of collectSPACE.com (which is a SPACE.com partner). Endeavour, he added, "more or less saved Hubble and helped give it the legacy it has today." The International Space Station can date its birth to Endeavour's STS-88 mission in December 1998. That flight took the first American component of the station — the Unity node, the passageway that connects the working and living modules — to space and joined it to the Russian Zarya module, which was already in orbit. "By attaching Unity, it became a space station, and an international one at that," Pearlman told SPACE.com. On its final STS-134 mission, Endeavour made another significant contribution to the ISS, delivering the final big piece yet to be added to the station from the American side — the $1.5 billion Alpha Magnetic Spectrometer physics experiment. 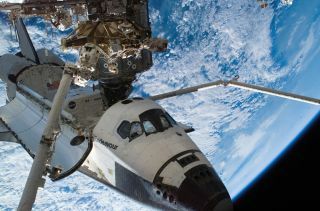 "Endeavour sort of bookends the International Space Station assembly," Pearlman said. Endeavour's second flight, the STS-47 mission back in 1992, broke new ground sociologically. Its crew featured the first African-American woman to fly in space (Mae Jemison), the shuttle's first Japanese astronaut (Mamoru Mohri) and the first married couple to fly on the same space mission (Mark Lee and Jan Davis).